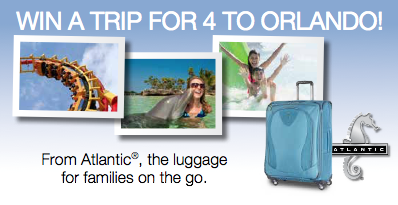 WIN a Family Trip to Orlando from Atlantic Luggage! Atlantic Luggage is hosting a Trip to Orlando Florida Sweepstakes, giving you the opportunity to win a family trip for four to Orlando that includes round-trip airfare and a hotel stay, two-day admission passes to 34 of Orlando’s best attractions, $150 spending money and four carry-on pieces of Atlantic luggage. Sounds pretty amazing, right? Atlantic Luggage really knows how to create a great piece of luggage, and they should, they’ve had a lot of practice! Atlantic Luggage has been around since 1919, creating lightweight, versatile and totally affordable luggage collections in a wide range of styles. Packing for your family trip has never been easier, wherever that trip is taking you! Whatever your traveling style, Atlantic Luggage has a piece of luggage perfect for you in gorgeous colors with great features! Do you remember that great Atlantic Luggage carry on suitcase I shared with you guys last year? Well, Angeline claimed it as her own as soon as I received it, so I was extra excited to receive some brand new luggage last month – this time it’s an amazing set of expandable Spinners from the Atlantic Luggage Compass Unite collection, featuring the Link2Go™ system! The Atlantic Luggage Link2Go™ system is a cool new way to attach two suitcases together. I received the 25 inch and 29 inch Compass Unite Expandable Upright Spinners, and they attach back to back with Velcro straps on the side. You just attach them and then stroll as you normally would with your suitcase! You can even attach up to four different pieces – enough for your entire family’s possessions while you travel – and maneuver through the airport with ease! Of course, they are all perfectly fine to use independently as well. I took the 25 inch Expandable Spinner with me on a Caribbean cruise and I was able to pack everything I needed for an entire week at sea, plus all of my snorkeling gear and photography equipment PLUS I had room to pack snacks, drinks and to bring home souvenirs too! The Compass Unite collection featuring Link2Go™ from Atlantic Luggage is really lightweight, and they fit SO MUCH inside! I have to say though, my favorite feature is that Spinners are four-wheeled and spin 360 degrees! It makes it much easier to roll your suitcase around an airport, cruise ship or through a hotel hallway when it will roll any which way you point it! While there is plenty of room inside Atlantic Luggage, I still don’t like to waste space. Roll up you clothes to make more room for clothing in your suitcase. Stuff small articles of clothing into your shoes to save even more space! Always bring along a few gallon-sized or “extra large” Ziploc bags on your travels and use them to store dirty shoes or wet clothes so that they don’t ruin your other clothes! Throw a scented dryer sheet in the bottom of your suitcase. It will act as a deodorizer for your suitcase and make all of your clothes smell like they just came out of the dryer during your travels! Always pack your toiletries in Ziploc bags – no matter how well you pack your suitcase, sometimes the pressure changes on a plane can cause the top of bottles to come off, which can result in a mess. Win BIG in the Trip to Orlando Florida Sweepstakes, courtesy of Atlantic Luggage! The Trip to Orlando Florida Sweepstakesincludes round-trip airfare for four, 3 nights of hotel stay, four two-day admission passes to 34 of Orlando’s best attractions, $150 spending money and 4 carry-on pieces of Atlantic luggage Total prize value of $4,270. This sweepstakes runs May 15, 2015 – June 15, 2015, and a winner will be chosen within 7-10 days following the close of the sweepstakes. The Grand Prize trip must be booked by March 31, 2016 and travel must be completed by June 30, 2016. You can also enter for a chance to win a 3-piece set of Atlantic Ultra Lite 3 Luggage from my blog! YAY!! I don’t do much traveling, but it’s been ages since I bought luggage and I’m in need of some new pieces. Those look really nice, and I’ve heard only good things about Atlantic luggage. My Hubs and I are on the search for some new luggage. I like how these ones attach to each other for easy moving. You have no idea all the tricks I go through to get my luggage moved from one place to the next. This looks like a great option for luggage. I like how you can connect them together. That is an extremely nice luggage set! I like how they hook together! I would love to win a trip to Orlando. Haven’t taken my family yet. I love that bag. It looks awesome. I would also love to win a trip to Orlando! I am definitely not adverse to winning a family trip to Orlando. Most of my family is in Florida, so any chance we get to visit is a good one! I love how the bags can connect! When we go to the airport with our kids, I need a spare hand to hold on to the 4000 things we carry with us! First I need to tell you, cute Coach Bag. I wanted to move to Orlando Florida but those plans quickly changed but I do hope to visit soon. I entered to win! I would love to win some Atlantic Luggage! I love how the carry on attaches to the checked bag too! Of course a trip to Orlando sounds amazing! oh what a fun vacation that would be. I need new luggage too. I’ve had mine 23 years. Oy. I would love to enter but keep getting page not available?? How can I enter?? We travel a lot and are in need of some good suitcases! Will have to check these out. We fly and travel frequently and this looks like a great size! They look really easy to use and like they would stand up to airline abuse. The trip sounds amazing! We have never taken the kids to Orlando and would love a family vacation. That is a great giveaway! Whoever wins would absolutely enjoys and get a lot of use.I like the style of the luggage.Hopefully I will win. This is a fantastic giveaway. Orlando is a fun place to stay with the whole family, we use to live there and there is so much to do! There are tons of families out there that need this vacation. I hope the winner enjoys their trip! Good Luck everyone! This is great! I am an avid traveler and in need of some new gear. Very innovative and great use of space we all know ever spare nook and cranny can fit something for our travels. I always seem to gravitate to the big name brands but this has changed my mind! Great post! I love how the pieces strap together. I always wind up carrying my mom’s luggage when we travel. So, this would be heaven sent. I also like the tip about adding a dryer sheet to my luggage. I will definitely be incorporating that into my travel packing moving forward. Thanks!